I use an RFSpace netSDR to record the 43 meter (6800-7000 kHz) pirate radio band, overnight and often in the daytime as well. I then go back and check the recordings, to see what stations have been on the air. This lets me catch lots of broadcasts even when I am away from the shack. 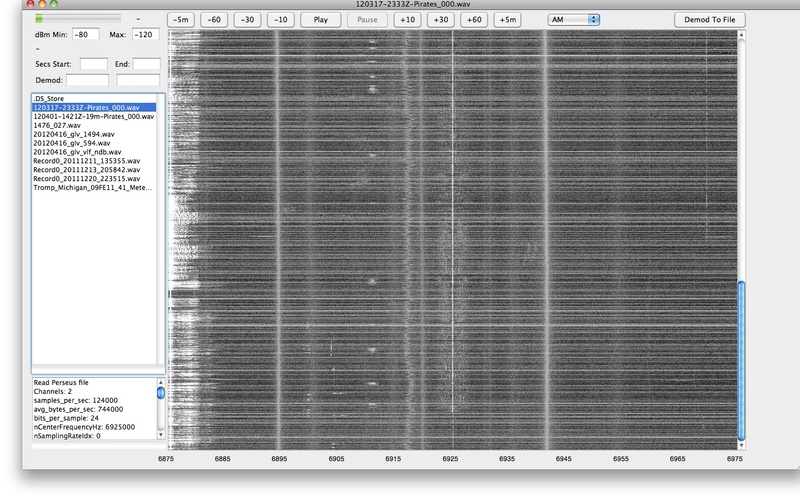 Going through the recordings with traditional SDR software can be extremely tedious. You literally have to play the recordings at a real time rate, hoping to stumble across a transmission. Even being able to skip ahead and back is not much better. So I ended up writing my own app to make the process of analyzing SDR recordings for interesting transmissions much easier and faster. I’ve just recently made this app available for others to download and use. It’s called mySdrPlayback (although it could probably use a more catchy name). When the app loads, it reads in a list of all the recording files from the directory you have told it they are stored in. Clicking on a file loads it. A waterfall of the entire file is created, that is what you see in the large area on the right side of the window. The x axis is frequency, the y axis is time. Any transmissions are immediately obvious, such as a pirate on 6925 in AM mode, as well as WWCR, also in AM mode, on 6875 kHz. SSB and the various digital modes also have distinctive visual appearances. In no time, you can tell what type of transmission it is just by looking at it. Files created by SpectraVue, the SDR app that RF Space supplies with their radios, SdrDx, the third party app also for RF Space radios, as well as files created by Perseus can be read. Other file types could probably also be added, if their exact format is known. Selecting a portion of the recording file to play back could not be easier. Just drag select with the mouse by drawing a rectangle around it. Select the mode, and click Play. The frequency and time limits are displayed in the Secs Start/End and Demod fields when you drag select, you can also edit them in the boxes by hand if needed, to fine tune things. The buttons to the left and right of Play let you skip playback behind or ahead by 10, 30, or 60 second increments, or even by 5 minutes. This makes it easy to jump around, looking for an ID. An S meter updates during playback, showing the signal strength in dBm. The Demod To File button will demodulated the entire selected transmission to a WAVE file. You can then feed that into a decoding program, such as MultiMode if you want to decode an SSTV or other digital mode. You can also convert it to an mp3 file using your own utility, if you want to post it for others to download.